Leaders from business, government, and non-profit organizations gathered in Chicago today at a conference hosted by the Pew Center on Global Climate Change to discuss ways to advance energy efficiency in the private sector. 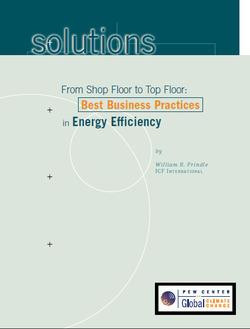 The two-day conference will focus on key takeaways from a newly-launched Pew Center report titled “From Shop Floor to Top Floor: Best Business Practices in Energy Efficiency”. 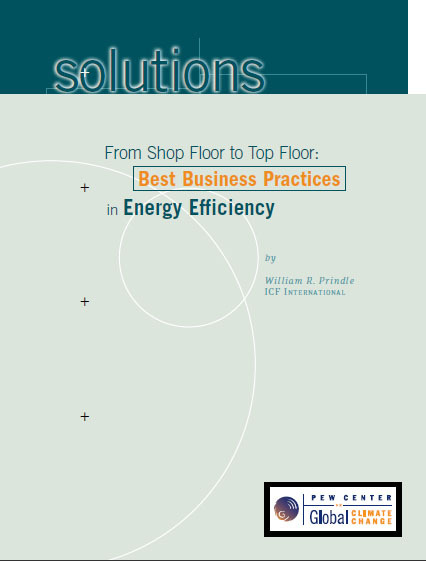 This report documents leading-edge corporate energy efficiency strategies and provides guidance and resources for businesses looking to reduce energy use, save money and shrink their carbon footprints. The report covers efficiency strategies for internal operations, supply chains, products and services, and cross-cutting issues. The report is part of a multi-year project led by the Pew Center and funded by a three-year grant from Toyota. The project included a detailed survey of major corporations; in-depth case studies of six companies; workshops on key energy efficiency topics; broader research in the corporate energy field; and development of a web portal to provide a platform for updating key findings from the project and providing tools, resources, and other important information. The Pew Center will follow the conference with additional communications and outreach events to help perpetuate the key findings of the research.